Dimensions (HxWxD): 19.3"x 13.8"x 20.3"
The Swingline stack and shred 200X auto feed shredder is a perfect business shredder suitable for use by 1-5 individuals. It caters for moderate security shredding needs for any department. Owing to the shredders automatic operation, the user can simply stack up to 200 sheets in the top tray, shut the lid and walk away. This Swingline 200X auto feed shredder also takes care of your small shred jobs and shred up to 7 sheets of paper manually. With the Swingline 200X auto feed shredder you can now spend more time on important tasks than spend hours each week shredding documents without having to stand next to the shredder. This powerful 200X auto feed shredder has security level 3 (P-4) and can shred documents with paper clips and staples destroying them into approximately 377 pieces. There is a separate slot for shredding CDs and DVDs. 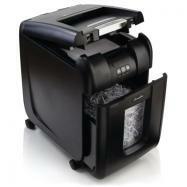 Moreover, the user can also shred credit cards manually with this Swingline 200X auto feed shredder. The shredder also includes Intelligent Auto+ Jam Clearance in order to prevent paper jams and deliver uninterrupted shredding operations. Moreover, the user can also manually reverse in case of jam. The Swingline stack and shred 200X auto feed shredder delivers ultra quiet operations and is incorporated with an Intelligent power save auto shutdown and wake up feature. In addition, it also has intelligent self-cleaning cutters that prevent shreds from building up on the cutters. The Swingline stack and shred 200X auto feed shredder has a large view window and a full bin indicator that tells when the 9-gallon bin is full and can be easily emptied. Stack and shred 200 sheets of paper automatically. Can shred up to 7 sheets at a time manually. 2 year warranty on machine, 10 years on cutters.